Go into almost any gift shop these days, and you’ll see paperweights, ornaments, or other decorations consisting of little crystal blocks with 3D laser-etched figures inside: a local landmark, a comic book hero, or whatever. You can even find booths set up where someone will take a 3D scan of your head and convert it into a work of art right there on the spot. Working from the scanned coordinates, a laser beam focuses on a tiny spot inside the crystal, heating it until it cracks slightly, and in so doing makes a visible dot. It repeats this a few thousand times at various spots throughout the glass block and next thing you know, you’ve got a lovely image, especially when it sits on its custom-made stand (available at extra cost), illuminated from beneath by colored LEDs. I thought this was a pretty cool effect the first time I saw it many years ago, but now that these things are so ubiquitous they’ve lost their appeal to me. So my initial reaction upon seeing a Lichtenberg figure, after receiving a recommendation from a reader to look into them, was similarly ho-hum. The picture appeared to be just the same as the laser crystal art—right down to the LED-illuminated base—except that the pattern looked like lightning rather than someone’s head. Lovely, I thought, but no big deal. However, on closer examination I discovered that the similarities were superficial. What had made this image was in fact a wholly different and much more interesting phenomenon. During a thunderstorm, if you look up into the sky, you may see lightning that appears not as a single jagged bolt but as a series of interconnected branches that look very much like roots coming from the clouds. If you were to look more closely at a photograph of the lightning, you’d notice that the irregular branches have smaller sub-branches, those branches have even smaller sub-branches, and so on. This gives lightning an overall shape resembling what mathematicians call a fractal, in which a pattern keeps repeating itself at smaller and smaller (or larger and larger) scales. Fractal-like shapes appear frequently in nature, most obviously in ferns and some kinds of trees, and are often seen in computer-generated artwork. In the case of lightning, the shape exists for just a fraction of a second. But what if you could capture that shape in a static form? German physicist Georg Christoph Lichtenberg discovered how to do just that in 1777. He generated a strong electrostatic charge and discharged it through a needle touching a plate made of insulating material. He then covered the plate with resin dust, which stuck to the charged parts of the plate. The result was a two-dimensional image showing numerous radial lightning-like branches. Lichtenberg himself saw no practical use for this technique, but it was later to become the basis of all photocopiers and laser printers, which work by selectively charging portions of a drum, which then picks up toner in just the charged spots and transfers it onto paper. Occasionally, under certain very specific conditions, Lichtenberg figures appear naturally after a lightning strike. People who have been struck by lightning sometimes have red marks on their skin in this characteristic shape, and the figures may also appear on grass or other vegetation. And when lightning strikes sand, the sand occasionally melts into fragile glass tubes called fulgurites, which roughly resemble lightning branches and are, in the most literal sense, natural lightning fossils. 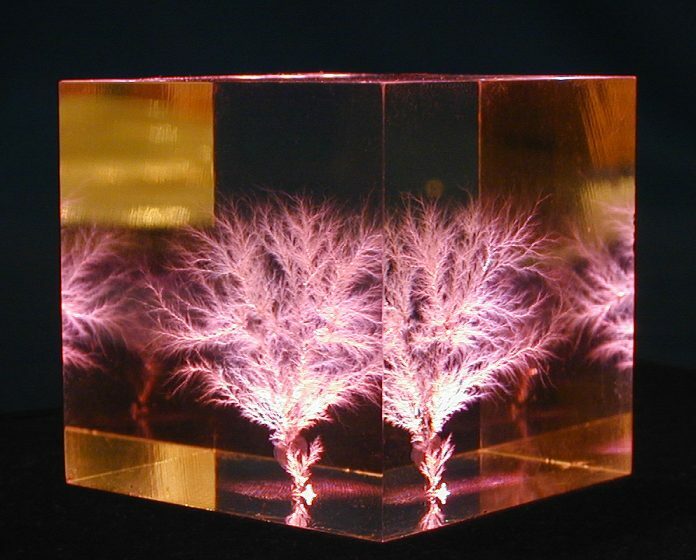 The most popular way to make Lichtenberg figures artificially today is to take a block of transparent acrylic and use a particle accelerator to bombard it with electrons. Because the electron beam is quite powerful, the electrons penetrate deep into the plastic. Acrylic is an insulator (or dielectric), meaning that it can hold a charge but current can’t pass through it. However, when the strength of the electric field passes a certain threshold, all those extra electrons begin knocking more electrons free, ionizing the acrylic molecules. This rapidly becomes a chain reaction (known as “dielectric breakdown”) in which portions of the acrylic spontaneously change from being highly insulating to being highly conductive. As the electrons all rush along this newly conductive path to escape the acrylic, they leave a visible trail of ionized acrylic molecules. Sometimes this breakdown (which, like lightning, takes a tiny fraction of a second) occurs spontaneously, as the electrons migrate toward an irregularity or defect in the acrylic’s surface; other times an artist provokes the discharge manually by striking the acrylic with a sharp, conductive object (like a nail). In any case, the result is a loud, bright spark and a lasting impression of the discharge path. Of course, the end result of all this is still a paperweight or desktop sculpture. But if you like to think of art as holding up the mirror to nature, this is just what you need: a miniature, three-dimensional image of lightning frozen in time. Note: This is an updated version of an article that originally appeared on Interesting Thing of the Day on August 14, 2006.